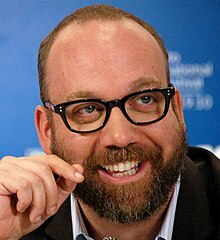 Paul Edward Valentine Giamatti (born June 6, 1967) is an American Actor and Producer. He played John Adams in John Adams, and William Hill in Saving Private Ryan. His first movie was Private Parts. He was born in New Haven, Connecticut and studied at Yale University. He has been married to Elizabeth Cohen since 1997. They had one son. This page was last changed on 9 April 2019, at 00:43.